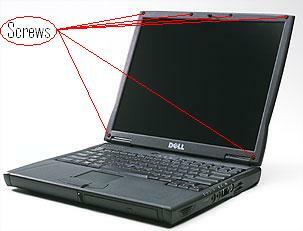 This is a general guide on how to replace an LCD on a laptop. Replacing an LCD is second to the most costly repair next to replacing the motherboard. I hope this guide will help you in repairing an LCD that has been damaged/destroyed. This is by no means an official super user manual. This write up is a check list and a general guide to help you replace a laptop LCD without having to purchase a new laptop. Disclaimer: I claim NO RESPONSIBILITY for anyone who fails in their attempt to replace a a laptop LCD or any damage laptops can receive following this guide. I am just trying to inform others from the steps I have taken and the problems I have come across. Alright. You just ran over your laptop and you are ready to replace that cracked LSD’d LCD display. Let’s see what we can do. I advise those who want to replace an LCD on a laptop to read the artcle “How to Replace a DC Jack”. It will help give disassembly steps that you will help you replace a laptop LCD. The process in replacing a laptop LCD is much easier than a DC Jack replacement. 1) Do your research. Find out what type of LCD you have in your laptop. This is really important. It becomes costly, considering LCD replacements can range between $100-$300. I have ordered wrong LCD for laptops before. I once ordered an SXGA laptop screen for a Dell when the laptop took only a normal XGA. The screen looked like poop. There may be different screens for the exact same model laptop. Make sure you find the correct display type for what you have. 2) Preparing for surgery. So your replacement screen from ebay came in and it has to be installed. The next step is to decide if you are going to remove the laptop frame or not. Personally, I like to remove the frame so I don’t risk any funny business with the laptop itself. Removing the frame to the laptop also allows more freedom in movement and more visual cues. It’s purely up to you. 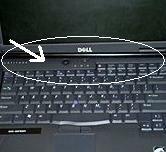 This is a picture showing the most common place to remove the screws for the hinges to the laptop. If you decide to remove the frame from the laptop, the front panel has to be removed. When the front panel is removed, you will see the hinges and the cable connecting the LCD to the motherboard. You can remove the cable, and unscrew the hinges to remove the frame from the laptop. Any time you remove screws, document the steps you take with the paper and pencil so you can reassemble the frame with ease. 3) Look at the frame of the laptop LCD Frame. You will see cover stickers or cushion tabs. These are the places where the screws will hide. Using a very thin flat head screwdriver or a knife, carefully dig underneath these stickers and cushions and remove them. You want to be careful because you will need to cover up the screws again using these cushions. When you remove the screws. make sure you place these screws and covers in an easy place to find. Personally, I place the cover stickers and cushions right next to the hole where I removed them. I use tape to keep the screws together and in a safe place. 4) Next comes the tricky part. The frame from the LCD screen will not fall off. It will appear latched to the frame. That is because it is latched to the frame. This is where your fingernails will come in handy. Using your nails, you must dig into the frame and snap it off. Try not to press onto the LCD too much. When you unsnap the frame in any given area, it will become easier to snap it off around the whole frame. Just be really careful not to break the frame itself. 5) So you removed the frame. You can see the edge of the LCD and maybe the inverter. If you look on the right and left edges of the frame, you will see screws holding in the LCD screen. At this point, you will have to be extra careful on removing the LCD. Remove the screws that you see on the edges. Be careful when you removing the last screw. You don’t want to damage the cable if there is no cushioning. Avoid touching the edges of the LCD. You will see the connector cable at the back of the LCD. Carefully remove this cable. Most of the time you have to pinch the cable to remove it. Make sure you don’t damage the cable, otherwise the new LCD won’t work. 6) The old LCD is out and you are ready to put in the new one. 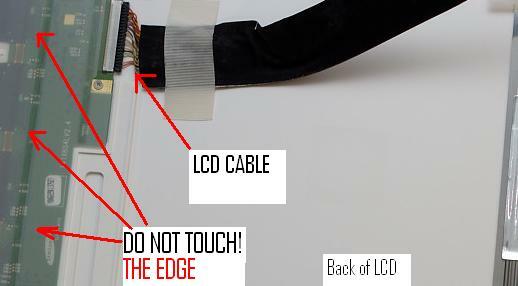 Once again, be very careful not to touch the edge and components of the LCD. The edge is where the all the magic happens. It’s where the interface between the circuits and the LCD goodness happens and disturbing the edge can make your new LCD look like poop. Place the cable onto the new LCD and CAREFULLY place it into the frame. Once again…DO NOT TOUCH THE EDGES! When the LCD is back in the frame, put the screws that you removed and screw them into the frame. When the screws are tied down, now is the time to plug in the cable to the motherboard and test the laptop. We need to see if the LCD works. Turn on the laptop with the cables plugged in. If the screen works, turn off the laptop and put the rest of the frame together, and reattach the frame to the laptop (if you took it off). You are done. When the new LCD is installed, if the LCD powers on and it has colorful lines going through it or it looks bad, turn off the laptop, remove the LCD again and reseat the cable plugged into the back of the LCD. If it still does not look correct, then you might have a bad cable. It is also possible you may have a bad interface between the motherboard and the component that plugs into the cable. In that case, it’s time for a new laptop (unless anyone has any better solutions). I hope this mini-guide helps you replace an LCD. Make sure when you replace the LCD to properly dispose the old LCD at a recycling center.